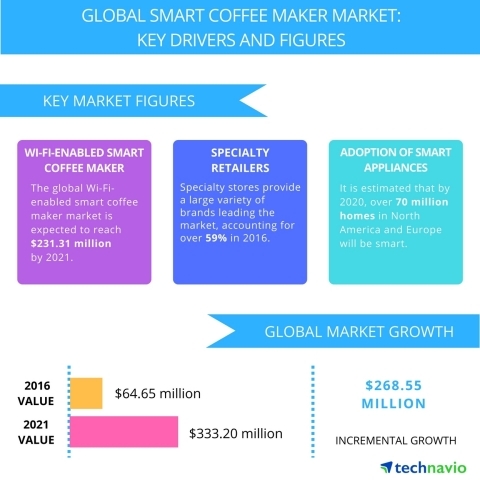 LONDON--(BUSINESS WIRE)--Technavio analysts forecast the global smart coffee maker market to grow at a CAGR of close to 39% during the forecast period, according to their latest report. The research study covers the present scenario and growth prospects of the global smart coffee maker market for 2017-2021. To determine the market size, the study considers revenue generated from the sales of smart coffee makers by the global vendors. The market size of smart coffee makers is expected to reach USD 333.2 million by 2021. EMEA will be responsible for generating maximum revenue and also the highest incremental growth for the market through the forecast period. The UK and Germany are currently the highest revenue generators in the market. However, France, Spain, and Italy are likely to be hotspots for smart coffee makers in EMEA through 2021. Emerging Eastern European countries have tremendous potential for improvement due to increasing living standards and increase in urbanization. “Remote access convenience is one of the key factors for the growth of the global smart coffee maker market. Bluetooth and Wi-Fi enabled smart coffee makers are widely adopted by tech-savvy consumers. The users can operate smart coffee maker from anywhere inside the house and can provide instructions via a smartphone,” says Poonam Saini, one of the lead analysts at Technavio for retail goods and services research. The smart coffee maker from Mr. Coffee, allows the user to schedule, modify, and monitor coffee from an app on a smartphone. Similarly, The WeMo app lets the user turn the coffee on, adjust the timings, and even shut the coffee maker off through the app. Such innovative offerings by vendors are pushing for increased adoption of smart coffee machines. Innovative and customizable smart coffee maker offerings by consumers are attracting a wider array of consumers to the market. Smart coffee machines are equipped with features like scheduling, adjustable brew timings, cool-to-touch, spill proof, providing notifications for water and coffee bean levels, and other value adding features. With time, these machines learn the user’s preferences, which is driving the increasing adoption of smart coffee machines. “Smart homes are residential dwellings equipped with efficient energy management, security and control systems, home appliances, and other assisted living appliances and equipment, which are all connected through the Internet. It is estimated that by 2020, over 70 million homes in North America and Europe will be smart,” says Poonam. The primary factor driving the demand for smart appliances such as smart coffee makers is the need for high-end and energy-efficient appliances, which cater to increased living standards. The response for smart coffee makers has been positive so far and is expected to witness increased sales due to an increasing need for connectivity and better living standards through the forecast period. Technavio analysts forecast the global smart coffee maker market to grow at a CAGR of close to 39% during the forecast period, according to their latest report.